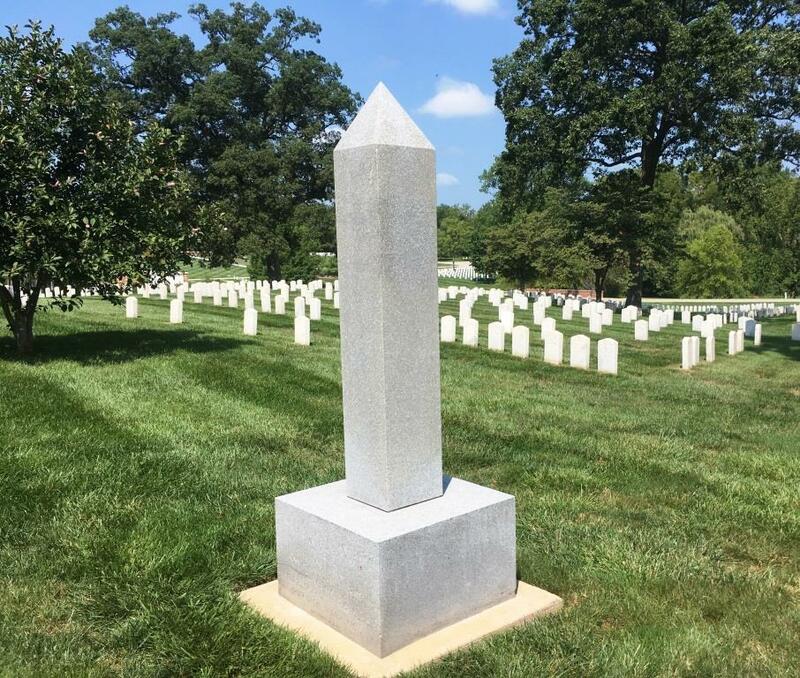 Note: Camp Butler itself (see link below) describes its Confederate obelisk as a “monument.” However, it probably is more accurate to call it a “memorial,” because the obelisk was erected, as its inscription says, in memory of Confederate soldiers buried there. The difference is explained here. Also, Gary Shapiro, professor of philosophy at the University of Richmond, went into more detail in a New York Times op-ed. This entry, including its title (originally “Sangamon County’s Confederate monument”), has been edited to reflect that understanding. Sangamon County’s only Confederate memorial is a 7-foot-tall obelisk erected in the middle of the Confederate burial section at Camp Butler National Cemetery in December 2005. Sponsors of the memorial, according to an inscription on the base, were: The United Daughters of the Confederacy; Seven Confederate Knights Chapter 2625; Illinois Division, Sons of Confederate Veterans; Illinois Society, Military Order of the Stars & Bars; and the Order of the Southern Cross. In memory of the Confederate veterans who died at the Camp Butler Confederate prison camp. May they never be forgotten. Camp Butler opened in August 1861 as a training camp for the Union Army, but was converted to a prisoner-of-war facility in 1862. The first 2,000 prisoners arrived at Camp Butler in February 1862, following the Union Army’s conquest of Fort Donelson, Tenn. Another 1,000 arrived after the capture of Island No. 10 (Missouri) in April. Prisoner exchanges emptied the camp by October, but an estimated 1,665 new Confederates were sent to Camp Butler in early 1863. Barracks were often full, forcing prisoners to live in tents. Illness reached epidemic proportions – pneumonia was a constant problem. When the last Confederate prisoners departed on May 19, 1863, more than 800 of their comrades had been buried in the prison cemetery, victims of inadequate facilities, poor sanitation, and disease. The Confederate gravestones can be distinguished by their pointed tops. Gravestones for the rest of the 20,000 veterans and their spouses buried at Camp Butler are rounded. When the Daughters of the Confederacy and other groups planned the dedication of the obelisk, they originally intended to display the Confederate flag during the ceremony. Facing objections from the NAACP, the Anti-Defamation League and other civil rights groups, however, the ceremony organizers decided not to request a permit to show the flag. Confederate flags are banned from display in national cemeteries except in specific circumstances. In addition to the 800-some burials at Camp Butler, at least two dozen Confederate veterans of the Civil War are buried elsewhere in Sangamon County. The most prominent probably was Andrew Jackson Butler (1827-1902), a Virginian who moved to Illinois in 1869. According to his biography in the 1904 Past and Present of the City of Springfield and Sangamon County (repeated on his Findagrave site), Barber served as purchasing agent for famed Confederate Gen. Stonewall Jackson, rising to the rank of major. Barber moved in 1869 to Sangamon County, where he operated a prosperous stock farm near Cantrall. He is buried in Fancy Creek Cemetery. Andrew Jackson Barber’s two sons, John and Clayton, founded the Springfield law firm that now is Barber Segatto Hoffee Wilke & Cate. This entry was posted in Historic Sites, Markers, Military. Bookmark the permalink. Thank you for this piece of history……I grew up in Springfield, really never knew this….Hopefully this piece of history will stand….As the truth never changes. I completely missed the controversy in 2005! Then we could say that we’d like to have a bias toward preserving historical artifacts, but be open to adding information to them to put them in historical context. The anachronisms, on the other hand, like a statue of Lee built in 1924 to signal white supremacist power, deserve a bias toward removal, with the option to leave them in place but add information to put them into historical context. I thought when I proposed that idea that the Confederate marker at Camp Butler was probably in the first category . . . . but I was about as wrong as I could be! I’m not 100% certain it fits in the second category, either . . . it’s certainly in an appropriate location, and the explicit message carved on it is appropriate to that location and purpose. I imagine this monument will fly under the radar and pass through the Great Monument Reckoning of 2017 while local activists try to deal with more pressing matters like segregated neighborhoods and systemic bias against black citizens. Mr. Gwinn: Your distinction makes a lot of sense … which, sadly, is probably why it will never be enacted. Thanks for reading, and thanks for your thoughtful comment.